For the first time ever Metrolink, our Southern California commuter train operator, decided to operate 6 round trips from Riverside to Irvine so the public would not have to do battle on the Riverside Freeway through Santa Ana Canyon, a major traffic gridlock in the LA Basin. Following an Amtrak round trip to Solana Beach and an excellent Thanksgiving Meal, I went down to Santa Ana to try this unique Metrolink Service mid afternoon. The Metrolink Train pulled into Santa Ana heading out to Riverside with eight passengers boarding. One passenger who was in a wheelchair had to wait for the train running locomotive first to be double spotted as the cab car had the only ramp on the train so the train had to pull forward so the passenger could board. We left Santa Ana right on time and after crossing Interstate 5 we ran along Lincoln Street as we crossed 17th Street entering my neighborhood. Our train crossed Fairhaven Ave then snaked its way across Santiago Creek and under the Garden Grove Freeway into the City of Orange. Right after Chapman Avenue we pulled into the Orange Station where four more passengers boarded. Our train next went through CP Maple and out onto the Metrolink Olive Subdivision. We crossed Katella Avenue then rolled along Orange-Olive Road before we crossed the Santa Ana River and pulled into Metrolink's Anaheim Canyon Station on a beautiful clear day as four more passengers boarded. I talked with our conductor and received the Ridership Information for his trains today. Once we started rolling again and entered the BNSF I walked my Train 864 finding 43 passengers aboard as we headed east out into Santa Ana Canyon. We passed Milepost 38 Hobby Shop specializing in trains before I met fellow Orange County Railroad Historical Society Member Dan Dalke who had boarded at Orange. We started into the Horseshoe Bend meeting a westbound BNSF freight halfway through the curve. Traffic on the Riverside Freeway eastbound looked like it was moving about 20 MPH while we flew along without a care in the world. We crossed the Santa Ana River again this time on the BNSF Mainline at the Green River Golf Course before ducking under the Riverside Freeway twice within two miles prior to our next station stop at West Corona. We passed the other Metrolink Thanksgiving IEOC Train 867 just short of the North Main Corona Station. The train passed under both the Riverside Freeway and Interstate 15 then minutes later crossed Magnolia Avenue on our way to the La Sierra Station. Just east of La Sierra, we crossed over to the North Track before crossing Van Buren Blvd. 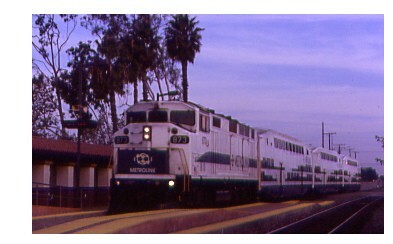 The train travelled east through Casa Blanca before making the large "S" curve past the cemetery and we entered the Metrolink Riverside Station at 4:14 PM, one minute early. Dan and I detrained, visited the refreshment machines before looking at the timetable rack. We walked back to near the front of our train and found a bench to enjoy the passing of three Union Pacific Trains and 2 BNSF Doublestack Trains. We boarded Metrolink 869 just as it was getting dark in Riverside and we left on time with 14 passengers boarding in Riverside as it headed towards Irvine. Dan and I passed the time away talking about many rail subjects including which railroad had the all time worst paint scheme. We passed the eastbound Metrolink 866 near the location of the old Prado Dam Siding. We ran on time to Orange where Dan detrained and I learned that this train had 33 passengers aboard it on this trip. We waited in Orange for a late running Amtrak 785 before proceeding to Santa Ana where I detrained off of my first ever Metrolink Thanksgiving Day round trip to Riverside on time.